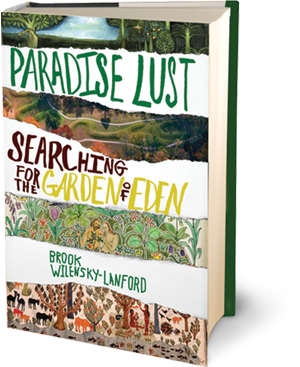 Paradise Lust is a history of people who’ve looked for–and found!–the Garden of Eden on Earth, from the late 19th century to today. But, I hear you asking, when Darwin’s theory of evolution permanently altered our understanding of human origins, shouldn’t the search for a literal Eden have faded away? Not so fast. These Eden seekers were obsessed. Many of them even drew maps. Where on earth did I find out about these people? And how did I become just as obsessed as they were? Here’s a teaser. In the beginning, I was just following a family rumor my father told me: my great uncle William, who died before I was born, had been looking for the Garden of Eden. William was a practicing scientist, an allergist at Columbia University’s medical center. If he thought he could find a Biblical place on the rational Earth, the news was surprising, to say the least. I imagined William with a martini at the Union Club, mapping the Book of Genesis on a napkin. Perhaps an olive reminded him of the forbidden fruit. A stickler for accuracy, he noticed the Bible never says “apple,” just “fruit.” He gave serious consideration to what species of fruit it might have been. Cocktail chatter or not, William believed that Eden was a real place. There must be a rational explanation for this, I thought. It should be easy enough to figure out where he thought Eden was, and why. Little did I know. People have been wondering where the Garden might have been for ages. St. Augustine had a theory, and so did medieval monks, John Calvin, and Christopher Columbus. Paradise Lust explores the enduring modern quest to locate the Garden of Eden, which has consumed Mesopotamian archeologists, German Baptist ministers, British irrigation engineers, and the first president of Boston University, among many others. These quixotic Eden-seekers all started with the same brief Bible verses, but each ended up at a different spot on the globe: Florida, the North Pole, Ohio, China, and, of course, Iraq. To learn where I think Eden is, you’ll have to read the book. Intrigued yet? You can read a little bit more about my research process in the first issue of The Common. Andrei Codrescu’s literary magazine The Exquisite Corpse published an advance chapter about the engineer William Willcocks, who found two Gardens of Eden in Iraq. And the new online journal Religion and Politics published an excerpt about the lawyer who found Eden in the Florida Panhandle. If you’re still not convinced, here’s how some very kind reviewers have described Paradise Lust.